Just like every vehicle has a manufacture date it also has an expiry date. This basically refers to the end of life stage of a vehicle when it is no safer to be driven on the road. Some vehicles simply get old with time and become inefficient to offer smooth rides. Whereas other cars just break down or get damaged in a mishap. Do you have a scrap car? Then, you will be struggling to get it off your property, regardless of the reason that has rendered it as old clunker. You will want to consider all your options to figure the best way out. Repair it or Sell Your Scrap Car to Wreckers? If your vehicle is badly broken down, then it will be pointless to spend huge dollars in refurbishing it. As it can cost you much more than the real worth of the automobile. Should I sell my car for parts on my own? Other than this, you can consider salvaging your car for parts and selling them as second hand. However, it will take your valuable time and efforts. So, selling your old vehicle might be the best option. But, who will buy your scrap car for cash? Well! Choosing a reputed and professional Brisbane car wrecking and removal business is a great way to dump your car. 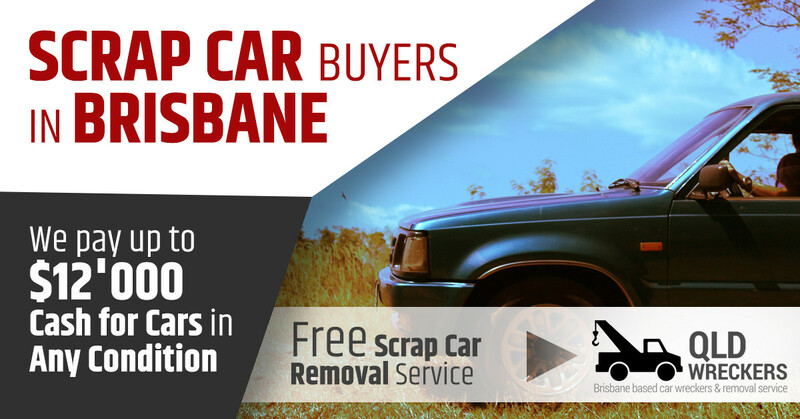 Scrapping Your Car in Qld? If you live in Queensland, Australia, you can scrap your car at Qld Wreckers. With their excellent passion in removing and wrecking scrap automobiles. You can expect to dispose your unwanted vehicle safely. All in all, Qld Wreckers is the perfect junk place for a quick and easy removal of your broken car. Being Top Cash for Cars Brisbane crew, we will give you an equally competitive value for your old vehicle. What are the great benefits of scrapping your car? Sell your car for cash without facing and trouble: Selling an old vehicle personally is a pretty difficult and excruciating job. It requires you to deal with a large number of buyers and negotiate to get best dollars. Plus, you cannot figure out exactly how much time it will take to get rid of your old vehicle. So, instead of investing your valuable energy and time in dealing with potential buyers. You can make a free call to Qld Wreckers and get the best help from our professional squad. We will make the task really easy by removing your clunker and paying you on the spot. It is really fuss-free as we will also organize all of the required paperwork. Earn some extra cash for trash: Everyone like the chance of getting some fair cash when getting rid of unwanted automobile. After all, it can be helpful as additional funds during hard times. Fortunately, you can remove your old car with us and get several hundred dollars for it. Why do you need scrap car buyers like us? We are a deeply knowledgeable company in scrap car dismantling business. As we have been practicing in this field for over 25 years now. This long period of time is a clear sign of our excellent skills and quality of junk car disposal & recycling service. In fact, we have achieved an excellent track record in paying reasonable price for damaged automobiles in Brisbane, Qld. Our large customer base is a great proof of this. We effectively work towards meeting our client’s requirements. That’s why, we have a well-qualified team to provide trouble-less scrap car removal service. We don’t just proclaim to give top cash but we pay it immediately prior to removing any questionable automobile. Sell Your Scrap Car to Wreckers – Easy to Deal With! When selling unwanted cars, it is difficult to find a company that is willing to pay a reasonable cash. You will even encounter a customer who is ready to take away your wheels, but are reluctant to pay for it. At the same time you will also find businesses who mention to buy wrecked vehicles for cash. But when it actually comes to removing the vehicle they hesitate to shell out a single dollar. This is where you can get in touch with the Qld Wreckers team. We will give you get the finest opportunity to earn highest possible cash for your scrap car. It is because we are highly dedicated to provide the best service to customers. Which is why offering outstanding customer satisfaction is the most important aspect of our service. Based on the scrap car prices in Australia, we will pay you highest ever cash up to $10’000. Who Could Ignore the Free Scrap Car Removal Service? We are reliable scrap auto Dismantlers with the most skilled team of removal specialist in Brisbane, Qld. Just contact us and we will remove your old car free of cost. We actively work around the clock to make our amazing services available to a large pool of customers. You can set an appointment from anywhere in Rocklea, Brisbane, Gold Coast, Logan, Sunshine Coast, Caboolture, Rockhampton, Ipswitch, Toowoomba and Warwick. Our team will reach out to you and execute the auto removal process in a totally hassle-free way. We take care to pay instant cash for unwanted cars. What kind and condition of vehicles are accepted? We believe that auto recycling is an excellent way of keeping the environment more green and clean. This is the reason we don’t keep any conditions when it comes to buying unwanted cars for cash. We are glad to purchase all types and conditions. You don’t need to feel nervous if your vehicle is junk, broken, totally wrecked, busted, unregistered or don’t have market demand. We will be able to wreck and recycle it to benefit the environment. As proper disposal of your old clunker will allow us to restrict the amount of scrap in the landfill. What Car Types & Brands are Worth to Sell for Scrap? Toyota, Daewoo, Mitsubishi, Volkswagen, Volvo, BMW, Nissan, Mercedes Benz, Subaru, Audi, Hyundai, Peugeot, Chevrolet, Holden, Ssang Yong, Honda, Kia, Isuzu, Ford, Chrysler, Jeep, Hino, Suzuki, Mazda, Fuso, Jeep, Land Rover, Range Rover and so forth. When you employ our outstanding services you have nothing to lose and all to gain. If you excited to figure out the fair value of your vehicle, don’t waste any more time. You are more than welcome to connect with our team today. Just give a bell at our number or look for a quote form on our website. There you will need to fill in the basic details about your auto. It must include your contact details and auto details like make, model, year, Km’s travelled and most importantly, condition. After analysing these details, we will form a precise estimate of your auto’s worth. You will get it ASAP.